Home Health & Beauty 1O USEFUL TIPS TO REMEMBER THIS SUMMER!! 1 1. All that long awaited summer holidays and late night chatting and you still don’t want to miss that morning walk routine, but be a little cautious! 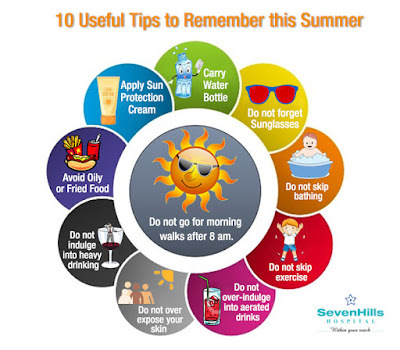 Do not be over enthusiastic and go for walks at 10 am scorching sun, as it may land you in sun stroke or dehydration. And you don’t want that to ruin your summer holidays. 2 2.Carrying & drinking safe water is the primary rule for any holidays, and if its summers it becomes a must! Do not forget to carry water bottle whenever going for shopping or outdoor activities and avoid drinking unsafe water as gastritis and stomach problems are fairly common. 3 3. Again being over-excited and indulging into favorite fast food may lead to stomach issues. Do not consume excessive oily or fried food as gastritis is fairly common in summer again to avoid all stomach issues. 4. We all like that little sun tan we can show off post holidays but always remember not to go out in sun unprotected, always keeps a sun protection cream of minimum SPF 30+. 5. Sunglasses are must whenever going out, protect your eyes with UV protected sunglasses. 6 6. Continuous long over- exposure to sun may lead to serious sun-burnt; avoid too much direct skin exposure. 7. I know summers are all about being lazy, but skipping bathing and excessive sweating may land you into skin fungal infections. 8. Do not indulge heavily into drinking along with a bad hangover it can also cause serious health damage. 9 9. I know breaking rules feels so good! But some sticking to the routine is a must! Do that regular exercise of yours to make it more fun you can do it as family exercises! 1 10. Kids and their aerated drinks are hard to separate during their summer holidays. But letting kids over-indulge in aerated drinks has some serious health implications; instead replace them with natural refreshing fruit juice.